Posted February 21, 2015 by Monsieur K.
When I was in the Detox Unit at the hospital, they taught me about “Triggers.” A “Trigger” is something that brings back the feeling of the old rush that heroin used to give me back in the day and then I am weakened and go see the dealer. 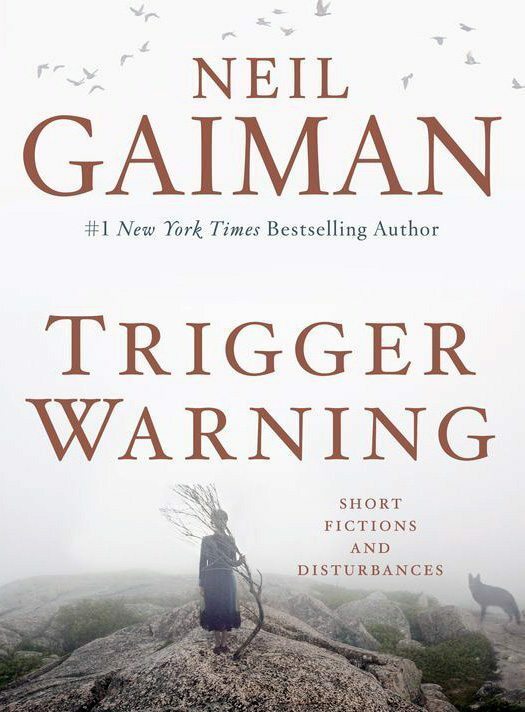 Neil Gaiman’s new book of short stories is called Trigger Warning: Short Fictions And Disturbances. It’s like a trigger that gives the good rush but instead of going out to buy heroin, I want to read another story. His book is that good. Neil Gaiman says, “We each have our little triggers . . . things that wait for us in the dark corridors of our lives.” As soon as Gaiman said that, I knew exactly what he was talking about and had a desire to read the book immediately. In this book, Trigger Warning, all of the wonderful places of the imagination are brought to life. Even in the Introduction, also written by Gaiman, I was “triggered” and I couldn’t stop reading. In many books I read a few sentences of the introduction and then jump to the story. In Trigger Warning I couldn’t stop reading his introduction. It was many stories within itself. There are books of short stories that are like crap shoots. Sometimes you win and sometimes you lose. In Gaiman’s new book of short stories, they are all winners. It was a rush. You see, my new addiction is reading. There is nothing better than settling down in a comfortable chair or lying on the bed and reading a great book. Trigger Warning is a great book. Neil Gaiman’s talent shines like it did in his graphic novel called The Sandman or his book called American Gods. When this man sits down to write the story flows and you can tell that the story has been percolating in his mind for quite some time. One of the short stories is called “Black Dog” and it is done so well that, as a writer myself, I could tell that Gaiman must have left it out of American Gods and it wouldn’t let him rest until he let it spill out of the miraculous trap door in his imagination. Neil Gaiman has been cursed. If he doesn’t let the stories out, they will come to him in his dreams and haunt him, wake him up in the middle of the night and, like a wild beast, chase him to the computer screen or pen and paper until he lets the story out. Imagine being trapped in a body full of moving illustrations that have beginnings and endings and not being able to rest until you let these “trigger warnings” out. Included in this thrilling group of stories is the novelette called “The Truth is a Cave In The Black Mountains.” This story was also separately published and illustrated by Eddie Campbell and won the Locus Award. Neil Gaiman originally lived in England and now resides in the United States with his wife Amanda Palmer, who is also a musician and a writer. You can find Trigger Warning at the Harvard Bookstore, an independent bookstore located in Harvard Square in Cambridge. Neil Gaiman’s stories come from the dark places that live in our minds. When you read them they change your perspective on reality.